Caption slip reads: "Photographer: Glickman. Date: 1952-02-12. Assignment: Train vs auto. 7 in car, 1 DOA. 4 shots of demolished car ar Lindley Avenue and Topham Street. 1 grab shot of Fred Halper holding Rennie Budd in ambulance. Elderly woman, Mrs. jenny Halper being treated at Valley Hospital (2 shots). 2 shots D. B. at Valley Hospital Mrs. Fanny Budd. Shots of Mrs. Ruth Welsh being treated by nurse Ruth Gifford at Van Nuys Receiving Hospital. 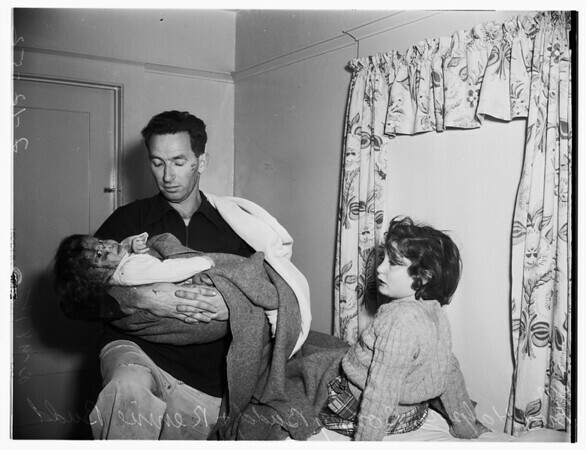 Miscellaneous shots of Fred Halper holding his niece Bonny Budd, age 18 months while her sister Rennie is on hospital table".